Discussion Who started learning golf on the HS team? Who started learning golf on the HS team? At what age did everyone start playing at? I started playing and taking lessons at our country club when i was 5 or so...never took the game seriously til i was about 13...now im addicted...before then it was just something i enjoyed to do now its a PASSION! I started around 3 years old just chipping around our lawn. Started taking it serious when I was about 8. Never took a lesson until I was 18. 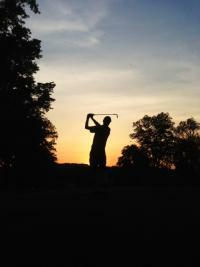 Started at age 12, now I am 15 and love it, I did learn to play competitve on my highschool golf team. Played since I was around 7 every summer while watching my brother play on the High School team. So, I just wanted to play on the High School team, which I'm on my 3rd year of now. I didn't really start taking it seriously until freshman year. I was too young to really understand the game when I was younger. I started when I was 11 and I just finished up my 3rd season at 13. And I am obsessed with the game. I can't get enough. I used to think it was boring but then all of a sudden it changed at 11 and I went crazy. I'm surprised how many people have pretty much the same background stories. As a lot of you have, i started golfing when i was little. It was mainly learning my basics like etiquette and rules. Since starting on the hs team i learned what golf competition is really about and love it!! it's one thing golfing for yourself but when everything starts to count, that's when you play your best and drive to get better! I started when I was about 10 hitting balls around the soccer fields by my house. I didn't really take the game seriously until last year when I was 14 and just finished my freshman year playing jv on the golf team. I started when I was round 11 just chipping balls around the yard, I played my first round of golf when I was twelve (only one round that year), and I started out when I was thirteen playing in tournaments, my second round ever was a tournament, I shot 51 from the senior tee's (9 holes), and my love just grew from there. I went from a 17 handicap at the beginning of 2004, all the way to a 4 now. I'm just addicted. I played my first round when i was 13 but did start playing much until i was 14 and then started taking it serious when i was 15. I am now 16 and am totally addicted. I am 20 years old, and have been playing since i was 3 years was when i had my first club in my hand. In High School i got alot of my friends in the game of golf, that is how they started in our sophomore year, majority of our golf team was beginners. I stated playing my freshman year. My dad always tried to push me into the game but i was a baseball player, and though of golf as an old guys sport. The summer before my freshman year, however, i played with my dad over our vacation because i was bored. Ended up being pretty naturally talented and fell in love with the game, i feel like i've had a club in my hand since. I started playing when i was 12, struggled as a rightie for a cpl weeks before switching to a leftie, and started improving from that day and every day since. It helped my progress that i have been on skates basically since i was out of the womb as my hockey background helped me get started. Short Canadian summers don't help, but I rarely take a day off in the summer and have started practicing between hockey and university in the winter.